Driving down the road no 5 from Rawicz to Wrocław, past Borek you need to turn left towards Żmigródek and before the bridge turn right into the dirt road through the gate. Down that road you reach the ruins. 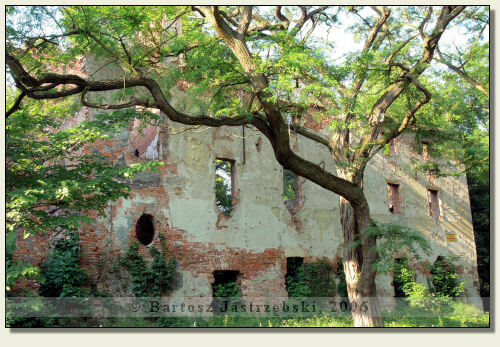 The first piece of information on the castle in Żmigród originates in 1296. 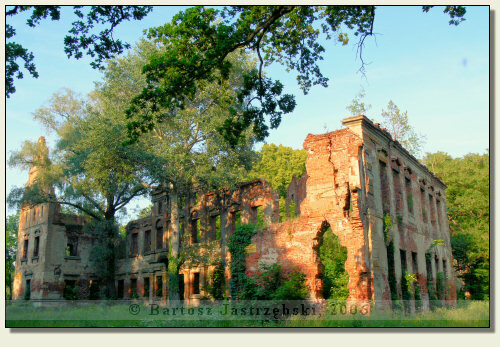 Nearly one hundred years later, in 1375, the castle belonged to the dukes of Oleśnica, and after dying out of their lineage, the stronghold was passed into the Czech king, Vladislas II's hands. 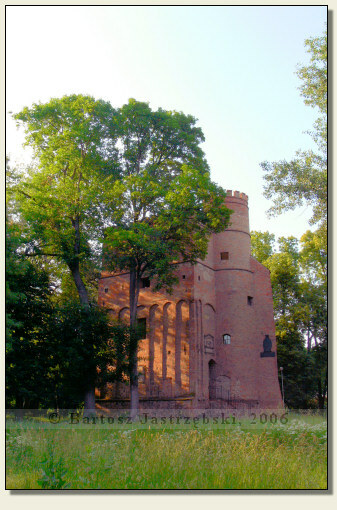 In the years of 1492-1592 the castle was under the family von Kurzbach's rule, and then Ulryk von Schaffgotsch bought it. 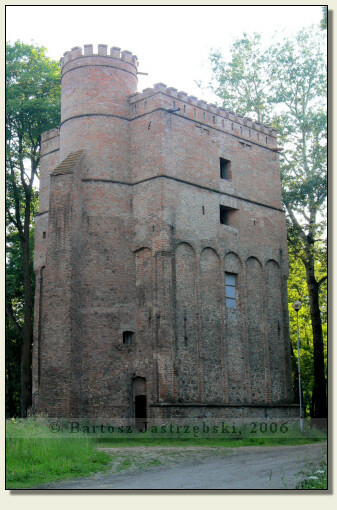 In 1560 Wilhelm von Kurzbach built a tower, which has survived up to this day. The stronghold was conquered by the Swedes in 1642, and after their retreat, since the XVIIth cent. 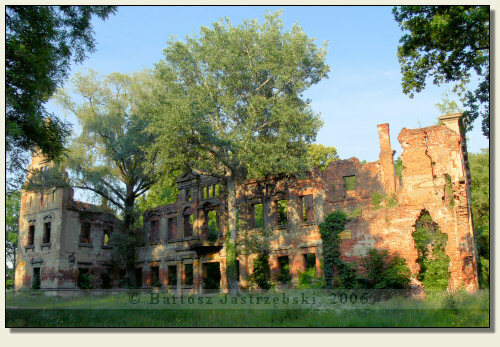 till 1945 the estate was the family von Hatzfeld's property. 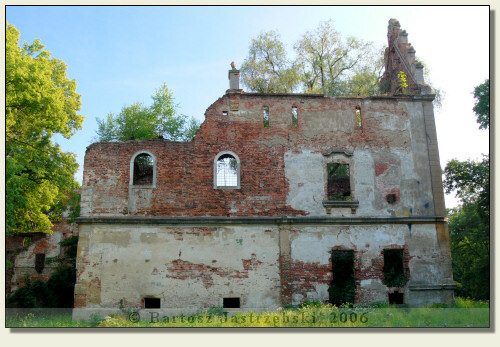 They thoroughly rebuilt the old castle, disassembling all the buildings with the exception of the tower. In the XVIIIth cent. the residence was modernized, whereas in the XIXth cent. the tower built by Wilhelm was heightened. 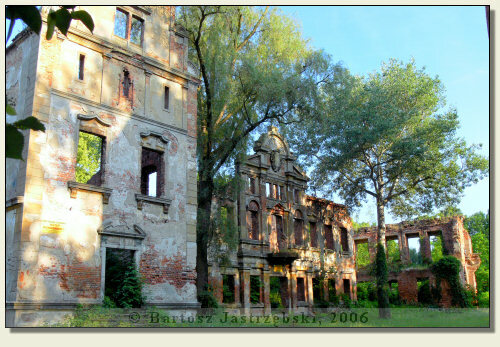 The buildings were destroyed in 1945 and have remained in ruin till now. Only the tower was renovated in the years of 1936-1937.